Enova and Chicago Cares Volunteer in Rogers Park - Enova International, Inc. Since 2014, Enova has been working with Chicago Cares to provide community service opportunities for its employees. On January 31, I had the opportunity — along with a contingent of 14 other Enova employees — to work with this program and visit the Daniel Burnham Apartments in Chicago’s Rogers Park neighborhood. These apartments serve as a living facility for lower-income seniors. The people at Daniel Burnham Apartments come from all around the world. There were several people from India, several from eastern Europe, and one woman who told me she was Assyrian. In order to communicate with this variety of individuals, the Apartments have a coordinator who speaks seven languages. Our first activity was creating Valentine’s Day art on a small canvas, which required the use of paint, heart-shaped cutouts, glue and buttons. Naturally, this got a little messy in a couple of cases, but everyone was good-humored about it. Some people lacked the dexterity to glue buttons to the canvas or to paint efficiently, so I ended up doing my fair share of work on a couple projects. I even made a nice one to use as an example! When bingo was finished, we had a nice lunch of hot chicken sandwiches that we prepared and birthday cake. A few different people thanked our group for coming and told us how much they enjoyed themselves that morning. All these activities were facilitated by the Chicago Cares organization, and they provided two employees to walk us through everything. One of them explained to me that many of these events are led by volunteer coordinators, and that there is always an avenue to help out in the Chicago area. 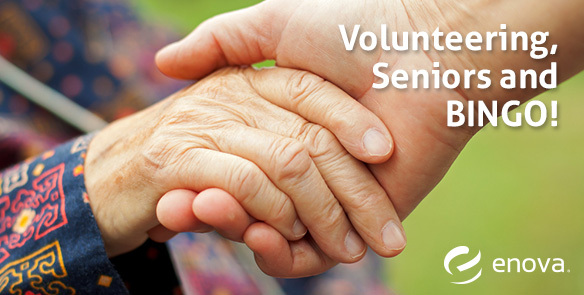 This is true whether your interest is in helping kids, providing academic assistance, working with seniors — there are seemingly endless opportunities to volunteer. It was satisfying to be able to step in and do something good for the community, especially for people who may not have a lot of family in the area with whom to visit. On top of making me feel good about Enova’s efforts in the community, this event has also made me more aware of Chicago Cares as an organization and more likely to look into other programs they offer in the future. If you would like to learn more about Chicago Cares, including upcoming volunteer opportunities, check out their site here!